With the recent election, the extension group were learning about all of the different parties. We chose one party to answer some questions about, like what kind of NZ are they keen on developing? 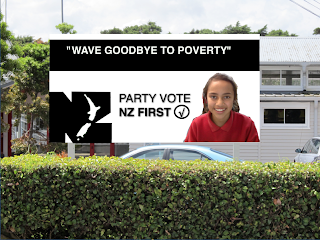 As you can see I chose the NZ First party, and then made a billboard as if I was a candidate for this area. You probably already know that it was the National party and John Key who won the election, but I thought and hoped that Labour would win.